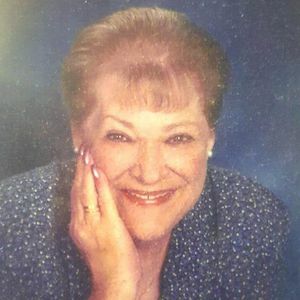 Gloria Jean Esposito, 72, of Goose Creek, South Carolina, wife of Patrick A. Esposito, died Friday, March 22, 2019. Her funeral service will be held Tuesday, March 26, 2019 in the J. Henry Stuhr, Inc., Northwoods Chapel, 2180 Greenridge Road at 12:00 pm. Interment will follow at Live Oak Memorial Gardens, 3093 Ashley River Road, Charleston, SC 29414. The family will receive friends Monday from 6:00 pm to 8:00 pm in Stuhr's Northwoods Chapel. Gloria was born May 23, 1946 in West Virginia, and raised in Indiana. She was the daughter of the late Edward McIntyre and the late Esther Formanski McIntyre. She met Patrick on a blind date and they were married for 52 years; she was a homemaker and taking care of her family was what she enjoyed most. Gloria was Baptist by faith and liked crafting. She is survived by her husband Patrick; a son, Patrick Esposito II of Goose Creek, SC; two daughters, Sharon Brigman of Bennettsville, SC and Trisha Esposito of Goose Creek, SC; granddaughters, Jessica Brigman and Hannah Price; brother, Dennis McIntyre (Diana) of LaPorte, IN; two sisters, Sue Wiltfong (Chuck), and Alice Hovey (Chuck) all of Michigan City, IN. Memorials may be made to American Cancer Society, 5900 Core Road, Suite 504, North Charleston, SC, 29406. I am so sorry to hear of Gloria Jean's passing. It's good to know she is safe in the arms of Jesus. Paul & I are praying for you all. To the family you have my deepest sympathy and my prays go out to you and may you endure as each day passes by. I am deeply saddened to hear of the loss of your wife, mother and sister. I never really knew Gloria Jean, only having met her once when I was a young child. Her and her family were in WV visiting our Grandmother and Grandfather McIntyre. Her father, Uncle Ed, would visit us in Ohio when I was growing up. May prayers and Gods blessings be with you. Life Stories provides friends and families a forum to post their favorite stories and memories of Gloria Jean Esposito ensuring the precious experiences are never forgotten. Share joyful times, post a photo that captures the moments you cherish, and allow others to reply, relive and remember.